Are you looking for a washable mouse with the look and feel of a standard mouse? How about a washable mouse without the hassle of wires? Then check out the C Mouse Wireless. This sleek Mouse is compact, light-weight and has a curved surface that makes for great ergonomics. The scroll wheel clicks as it spins and the buttons pop just like you are used to. You almost wouldn’t know that our engineers designed water-tight compartments inside the body to keep electronics safe during light washing and rinsing. The 1000 dpi sensor will allow you to work on almost any surface. You can wash the C Mouse Wireless with any EPA-approved disinfectant to help reduce hospital acquired infections or other illness causing germs. When synced with the Its Cool Wireless one USB dongle will operate both devices. Free up valuable USB space with Man & Machine’s wireless medical keyboard and mouse. SKU: CM/WI. 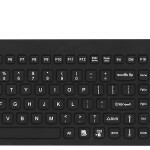 Categories: Medical Grade Mice, Waterproof Keyboard Product Line, Budget Keyboards And Mice for Dental Offices, Courtroom Keyboards And Mice, Value Keyboards And Mice, Office & Government Keyboards, Open Style Keyboards For Restaurants, Police Product - Recption & Office, Standard Keyboards For Educational Environments, Value Laboratory Keyboards, Value Products For Medical Environments, Waterproof Keyboards For Factories, Waterproof Open Style Keyboards For Boating.